Bangalore: In yet another achievement at national-level competition, students of Greenwood High International School, Sarjapur bagged multiple awards at the Innoventure Competition held recently in Pune. Innoventure, which stems from innovation and venture, is a national Ideation and Entrepreneurship Challenge for Children (4th to 9th Grade) which tests the entrepreneurship, innovative and venture skills of children. Karthik Ghoshal of Grade 7 won the first award for his innovative prototype whereas Ansh Kundu of Grade 7C and Vedant Narayanswami of Grade 6C won the second award respectively. 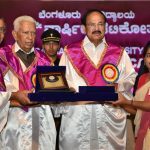 More than 400 schools from across the country had participated in the prestigious competition and out of these only 110 schools and 200 finalists competed in the finals. Beating these schools, Greenwood High was also awarded the “Most Enterprising School” prize at the competition. Students were given various real-life complex situations and were asked to provide solutions to these problems. Modern day parents often worry about their kid’s excessive expenses and are unable to keep a tack of their expenditures. Karthik Ghoshal provided a solution to this issue by creating an app prototype called “Spent -Up” which allows parents to keep track of their child’s expenses and also allows them to setup threshold limits on these expenditures. The app takes data from bank interfaces and anyone’s expenses via net banking, ATM withdrawals and credit card expenses can be monitored and reported back to the app. The app also included several additional features such as creation of 5 profiles and monitoring the spends, alerts upon reaching the threshold limits and itemized expense report for the period selected and thus was awarded the first prize in 7th grade category. Ansh Kundu whose innovation won the second prize in the same grade category at the event, by building an infrastructure to protect animals during floods named ‘Animal Rescue Shelter.’ Animals are often the worst victims of any kind of natural or manmade calamities. Ansh’s shelter was placed 500 meters above sea level, was 10 meters long and 40 meters wide which ensured that it did not sink during the flood. The shelter had two modern boats with two motors to increase speed, two computers connected with a satellite so that the computers could monitor the seas and oceans and check on any approaching flood. Vedant Narayanswami who won the second prize in 6th grade category made a prototype of an app called “MyCarParker”. This app provides solutions to issues related to parking problems. The prototype explained how establishments like malls and hotels can register with the app and share the number of parking spaces available with them. When a user searches for parking space using the app, it gives the result closest to the user. An OTP is generated for verification purposes. The student also made a physical solution called “MyCarRamp”, which uses mechanical and hydraulic principles to improve the existing solution of two-level car park already in use many malls.